Way back in the early days of Sitting In The Cheap Seats we had our first opportunity to review a Shakespeare play. In Chichester Festival Theatre’s cosy Minerva space we saw Frank Langella lead a great cast and firmly add to our love of the Bard! Fast forward a few years and we’re back at the Minerva, once again awaiting an award winning actor to take on arguably the finest of roles! Of course Sir Ian McKellen is no stranger to the role. He played Lear to much acclaim for the RSC ten years ago, touring the world in a glorious production that was committed to video and is worth seeking out. Now though, McKellen is closer in age to the King himself and keen to speak the lines, rather than declaiming them to vast halls full of people. He immediately makes the intimate space his own, the dialogue almost conversational and his Lear a warm-hearted soul with a twinkle in his eye. For all the acclaim that Andrew Scott’s Hamlet (rightly) received this is surely as good as it gets, an actor using every bit of knowledge he has acquired in a storied career to make his role feel so natural! Seeing McKellen up close could be considered enough, but he’s in the hands of a brilliant director. 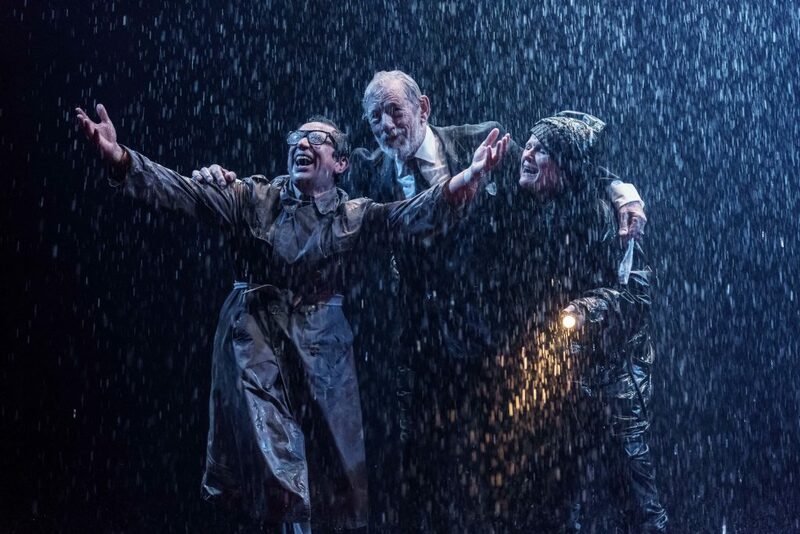 Jonathan Munby’s Merchant of Venice (with Jonathan Pryce as Shylock) was a glorious take on the text and again here he crafts a world that feels real. Of course Lear himself is the central role, but McKellen is surrounded by a uniformly excellent cast. Sinead Cusack gives us a loyal, caring Kent brave enough to stand up to her King but soft enough to provide a surrogate mother figure to Cordelia, here portrayed with a strong sense of pride in an impressive performance from Tamara Lawrance. Phil Daniels is that rarest of finds – a Fool who is both funny and remarkably poignant. Parading in a knitted cockscomb he elicits laughs effortlessly, when hunched behind his master in the deluge, rain smearing his glasses his dejected look will make audience members want to leap up and give him a blanket and a steaming mug of tea! I’ve seen a fair few Lear’s in recent years and often the weaker performances come from Regan and Goneril, no such worries here, Dervla Kirwan’s Goneril is every inch a queen in waiting, exuding an air of power with every step and glance. Kirsty Bushell’s Regan is more playful, girlish in early scenes her almost sexual squeals of delight at Gloucester’s blinding lead us to see she is just as strong as her sister, and a sight more devious! This then is about as good it gets, a wonderful play, a sublime lead and a divine cast in the hands of a masterful director! Hope and pray it has a life beyond five weeks in Chichester! Until 28 October. Visit www.cft.org.uk/whats-on/event/king-lear for more info.